Place the 9 "City" tiles in ascending order on the table (from the lowest (1) to the highest (25)). For each "City" tile, Shuffle the correspondingly numbered treasure cards and place them in a face down pile next to the "City" tile. Place the aircraft on the first "City" tile. 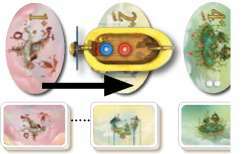 Each player chooses an "Adven- turer" tile (he keeps it in front of him) and places the "Adventurer" pawn of the same color in the aircraft. Shuffle all "Equipment", "Power" and "Turbo" cards into a single deck. Each player is dealt a starting hand from this deck. Players are allowed to look at their own cards. Place the remaining card deck facedown within easy reach of all players. Use the method you want to choose a player to be the first captain of the aircraft. "Amelia, Orville and Ambroise each have 8 cards in hand. They place the aircraft on the Wind city (1) and their pawns in the aircraft". 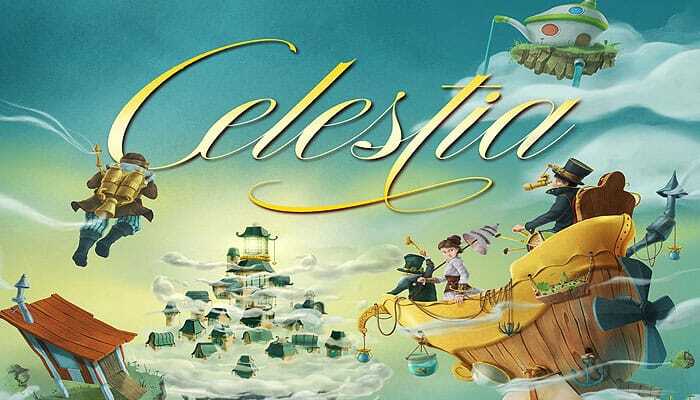 Each player aims to call at the farthest cities of the mysterious world of Celestia in order to discover incredible treasures. 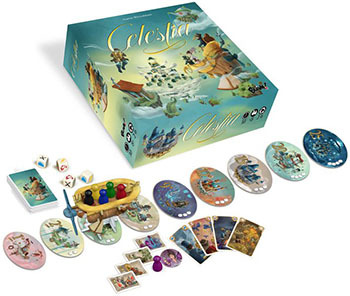 The player who forms the most valuable collection will win the game. 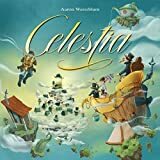 A game of Celestia is made up of several journeys during which adventurers travel in an aircraft, from city to city, towards Meiji, the City of Lights (25). Each journey consists of a number of legs. Captain : This player leads the aircraft during the current turn. He will have to overcome the events to reach the next city. Passengers : These are the other players who are still in the aircraft and continue the journey with the captain. Players take turns being the captain. The captain is responsible for bringing the aircraft to the next city. In order to do so, he will have to overcome all the challenges offered by this leg of the journey. Passengers must decide either to continue the journey or stay in the current city and claim one of its treasures. If the captain is able to overcome the challenges (using "Equipment" cards), the journey goes on; otherwise the aircraft crashes. The captain rolls the dice to determine the challenges. Each passenger chooses to stay aboard or disembark. The captain faces the challenges. The captain moves the aircraft. The captain passes the control of the aircraft to the next player. The captain determines the challenges he will have to face. To do so, he rolls as many dice as indicated on the next "City" tile. 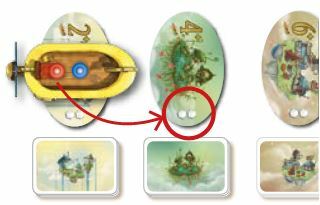 In order to continue the journey, the captain will have to discard specific Equipment cards to overcome the events shown on the dice. Caution: The captain shall NOT play the "Equipment" cards immediately after rolling the dice. He must wait for the passengers to decide whether they want to stay aboard or not. Note: Except in particular cases, the captain never abandons the aircraft. Orville is the captain during the first round. 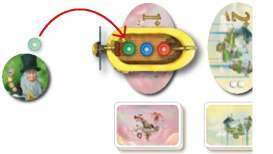 The aircraft is situated on the first city tile: he rolls 2 dice which show Lightning and Fog. In order continue the journey - and after each passenger has chosen to stay or not - he will have to play a "Lightning arrester" card to cope with the Lightning" and a Compass" card to navigate in the "Fog". Starting with the player sitting immediately to the left of the captain, passengers (players still in the aircraft) take turns declaring whether they will stay aboard or not. If the passenger feels that the captain will be able to overcome the challenges shown by the dice, he announces « I will stay » and leaves his pawn in the aircraft. If the passenger feels that the captain will not be able to overcome the challenges shown by the dice, he declares « I will leave ». In this case, he takes his "Adventurer" pawn out of the aircraft and puts it on his "Adventurer" tile. He then draws the top "Treasure" card from the corresponding deck and adds it to his collection. He is no longer a passenger, he does not take part in the rest of this journey. Note: At this moment, the captain may not disembark. Once all passengers have announced their intentions, and before the captain plays (or fails to play) his cards, "Power" cards may be used. All players, including the captain, may play any number of "Power" cards any time during this period. Amelia trusts in Orville: she decides to stay in the aircraft. Ambroise prefers to disembark. He removes his "Adventurer" pawn from the aircraft and puts it on his "Adventurer" tile. He draws the top "Treasure" card from the deck at the Wind city. 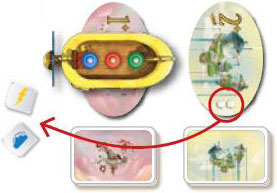 The captain must use the required "Equipment" cards from his hand to overcome the challenges shown by the dice. The captain must play one "Equipment" card for each die. Note: If several dice depict the same challenge, the cap- tain will have to play as many "Equipment" cards as the number of dice showing this challenge. Blank dice require no cards. If the captain managed to overcome all the challenges by playing all the required "Equipment" (or "Turbo") cards, he moves the aircraft to the next city. All played cards are discarded to the discard pile. Orville is a great captain. He has a "Compass" card and a ''Lightning arrester'' card. He plays these two cards and he and Amelia continue to the next city. Ambroise watches the aircraft fly away since he got off. If the captain cannot face all the events, he plays no "Equipment" card at all and the aircraft crashes with all its passengers. None of these players receives any "Treasure" card. The current journey ends at this point and a new one begins. Later during the journey, Amelia is the captain. In order to reach the next city, she must roll 2 dice. Orville stays in the aircraft. However, Amelia does not hold the required cards. Thus, the aircraft crashes. Neither Amelia nor Orville draws a "Treasure" card during this journey. Whatever the outcome of the previous, the passenger sitting to the left of the captain becomes the new captain. Note: A player who has left the aircraft cannot become the captain. 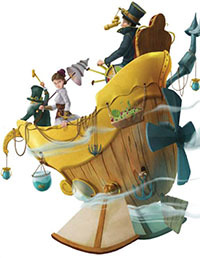 After the crash, Ambroise becomes the new captain because he sits immediately to the left of Amelia, the previous captain, and is back on-board because a whole new journey begins. This leg of the journey was uneventful. The aircraft is entering thick clouds. It becomes impossible to see where to go. The use of a navigation instrument is required. Reveal a compass "Equipment" card. "Such a tiny cloud will not stop us. My compass is clear, the way is straight on!" Lightning is about to strike the aircraft. The captain can save the crew by diverting the electrical discharge. Pull out your lightning arrester "Equipment" card. "Finally a storm, it will allow us to charge the batteries". A flock of damok-birds is surrounding the aircraft. They make threatening dives toward the passengers. Play your foghorn "Equipment" card. "Their shrill screams are nothing compared to the noise I can make with my horn. Dillydilly, dilly-dilly..". A pirate aircraft appears on the horizon. Pirates are determined to steal from all passengers, if not seize the aircraft itself. Use your cannon "Equipment" card. "What is more dangerous than a pirate? A cannon pointing at a pirate!" Return all "Adventurers" pawns to the aircraft. 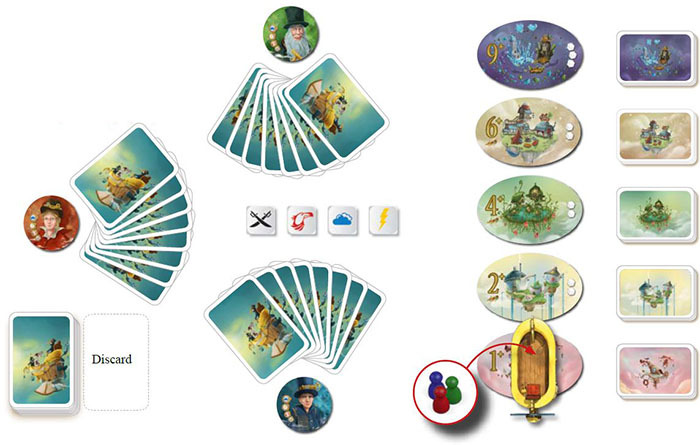 Each player draws a card from the "Equipment" card deck. Before the beginning of a new journey, if any player has reached 50 points, the game ends imme- diately.